At QbD, we invest in people every day. We give them the chance to grow and develop. We help them build solid teams and relations. And, of course, we ensure that they can count on stable processes and safe medical products. Improving the quality of life is in our DNA. This also goes for those who need that extra helping hand. That’s why QbD gladly supports many good causes: projects that really make a difference, driven by enthusiasm and goodwill. It’s one way to put our value ‘joy’ into practice. Because helping others is what brings us joy every day. Wonder what we mean by that? Here are some of the projects we regularly support. Good food is the motor of excellent ideas. That’s why the catering for QbD’s DenkTank gatherings is always provided by Bits ‘n’ Bites, an organization that is close to the heart of our CEO Bart. Bits ‘n’ Bites is on a mission: its manager Anne is eager to prove that disabled children can not only work in a bistro, but also prepare delicious meals. Bits ‘n’ Bites is a unique caterer that gives youngsters with an intellectual disability, who find it hard to get a job elsewhere, the chance to develop their talents. Working as equals, all colleagues make a difference here, enjoying the pride and pleasure of real teamwork. Just like we do at QbD! Do you have an appetite for more information? Check out their site www.bitsnbites.be! QbD also regularly sponsors Kinderkankerfonds, the organization that helps children with cancer and their families, while supporting scientific cancer research. In April 2017, QbD ran the Antwerp 10 Miles for this good cause. As every runner was sponsored by friends and family, the team collected a nice sum with its sportive efforts. CEO Bart willingly doubled this amount, which resulted in a € 3000 cheque that was donated to Kinderkankerfonds. In December 2014, QbD made the Warmest Week even warmer, by turning its directors into enthusiastic cooks who served burgers and jenever. The profit of this enterprise – as well as funds raised during QbD’s G-force 7 event – was donated to Kinderkankerfonds. De Lift is a private school that prepares youngsters with autism for a career in IT, thus increasing their chances in the job market. De Lift offers these special talents an education that adapts to their specific needs with tailored computer trainings. It’s a great initiative that QbD happily supports. That’s why we donate laptops and backpacks to this unique organization. Wonder how De Lift makes a difference for tomorrow’s IT specialists, with cool digital projects and specialized learning tracks? Then check out De Lift’s website, made by one of its students: www.delifteducation.be. What do you do when you make great limoncello, and you need original packaging that reflects its unique taste? That’s what we asked ourselves at QbD, when we had produced gallons of fragole cello (before you ask: this was the result of one of our teambuilding exercises). Luckily, Wase Werkplaats came to our rescue: this sheltered workshop bottled and labelled the fruit of our efforts. The labels themselves were designed by Kunst+, a non-profit workshop for artists with intellectual disabilities. The joint efforts of QbD, Wase Werkplaats and Kunst+ resulted in an original product that’s a real treat for all senses. Curious? Visit the sites of Wase Werkplaats and Kunst+. QbD sponsors the book publications of Raymond De Bruyne, a former high school teacher of CEO Bart. All earnings on these children’s books are fully donated to charity causes. 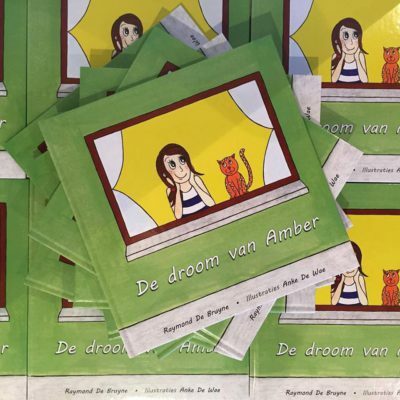 This year, sales on Raymond’s book De Verrassing (‘the surprise’) will support Bring a Smile (www.bringasmile.be), an organization that organizes unforgettable days for hospitalized and ill children. Previously, Raymond published stories to support good causes like With Love by Ferre, which aims to make children’s hospital rooms more cosy, and Cliniclowns. Or how well-told stories can bring comfort and relief in more than one way.